October isn't usually considered a great time for gardens: well, think again! DBG is full of color right now, and there is a sister garden in Lakewood, the Garden at Kendrick Lake, which is full of color and fantastic plants right this minute. I drove by late yesterday afternoon and took dozens (nearly a hundred actually) pictures of this "point and shoot" garden and was amazed that there was no one else there at that bewitching hour at one of America's great gardens. 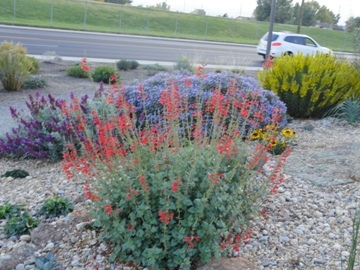 Lakewood is far ahead of other Metro municipalities in utilizing low water plantings in median strips and practically every city park there has some xeric beds featuring the best and showiest drought tolerant perennials grown to perfection and combined in artful ways with one another. These are merely four vignettes illustrating the truly astonishing way that the talented horticulturists of Lakewood (under the baton of maestro Greg Foreman) have created positively Beethovian symphonies of color. 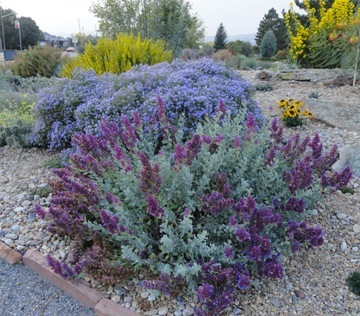 In this first image, Salvia pachyphylla (Mojave Sage) blazes against a background of Aster and distant goldenrod: all of them plants of champion size and perfectly grown. How do they do it? There are actually several fine clumps of Salvia darcyi at Kendrick Lake, this one combined with wonderful, bright complementary plantings that exemplify this amazing garden. I will be watching to see how it comes through the winter here. 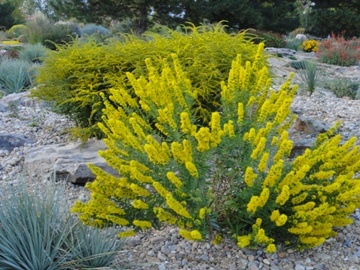 Goldenrod is not usually thought of as that special a plant in gardens, but these two goldenrods rate very high in my book: the foreground planting shows the Bluebird Nursery introduction which they call "Wichita mountains", which I believe is a particularly robust form of Solidago speciosa, and Solidago rugosa 'Fireworks' immediately behind (also promulgated by Bluebird). Seeing these here, one immediately has to have them in one's garden! Kendrick Lake showcases the very best drought tolerant plants: it is so gratifying to see so many cacti, unsual shrubs and especially grasses all grown so well and displayed with panache and artistry. 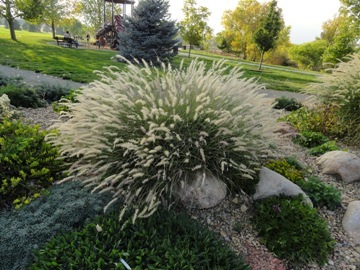 Who can look at this spectacular clump of Caucasian feather grass (Pennisetum orientale) and not simply have to have one at home? If you have not been to Kendrick Lake, you be sure and hightail it to the northwest corner of Jewel Avenue and Garrison in southwest Lakewood right away: you will not be disappointed! I congratulate the City of Lakewood on creating what I consider to be the finest park plantings in the United States (and perhaps beyond), demonstrating the very best cutting-edge horticulture. I make a point to visit every few weeks throughout the growing season.